“My family feels truly blessed that this situation happened at the time they were with me, “ says Michigan resident Eva Whitmore. After speaking with her for a while, you may be surprised to learn she is talking about a hospital stay, one that happened while Whitmore and her family were vacationing in Gatlinburg this past July. Their trip began in the typical ways, with family rides through the mountains and walks around downtown Gatlinburg. However, things took a turn by the middle of the week. Early Thursday morning, Whitmore abruptly awoke while experiencing severe pain in her stomach. Thinking it was just a bad tummy ache, she tried to self-medicate. When that didn’t work, and her stomach pain changed to sharp back pain followed by dry heaves, Whitmore knew she needed help. “I woke up my son, Tom, at 5 am and said ‘you have to take me somewhere,’” she recalls. Not knowing the area, her son began looking up urgent care clinics nearby on his phone, but Whitmore had a feeling this would need more than a clinic could provide. That spot highly concerned her doctor. He decided Whitmore and her son need to speak with a surgeon, specifically Dr. William Ngo, DO, with LeConte Surgical Associates. “Dr. Ngo immediately knew it was a twisted intestine,” Whitmore remembers. Within an hour, she was whisked away for laparoscopic surgery. “To me, that’s pretty fast,” Whitmore says. She had arrived at the emergency room early that morning, and soon after was diagnosed and getting treatment. After her surgery, Whitmore remained at LeConte Medical Center for several more days, missing the back half of her vacation. “On Thursday and Friday, we were planning on taking my grand-daughters horseback riding and zip lining, which I wasn’t planning on doing myself anyway. So, I was really alright with it.” She was thankful to be alive, and for the quick and quality care she received at LeConte. Within a few days, Whitmore saw her primary care physician in Michigan. 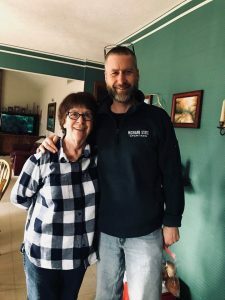 After assuring her everything looked well, Whitmore was referred to a specialist who confirmed what she already knew – Eva’s care at LeConte Medical Center was excellent. While she didn’t get to do everything she wanted to do while on vacation in Sevier County, Whitmore is thankful for her health. She knows it was a close call, and she is happy to be able to go on many more memorable, and hopefully healthier, vacations in the future.